Why Isn't Walt Disney Paying Cash for the 21st Century Fox Deal? The House of Mouse is issuing a whole lot of new shares to finance this buyout. Should shareholders worry? There are many ways to skin a cat, and even more options when you're financing a $52.4 billion buyout. In the case of Walt Disney (NYSE:DIS) acquiring most of 21st Century Fox (NASDAQ:FOX) (NASDAQ:FOXA), it's a pure stock-swap transaction that prints out 515 million new Disney shares for the benefit of Fox shareholders. What does this mean, and why will Disney dilute the holdings of existing stock owners by a staggering 34%? Let's figure it out. A basket of Fox assets, including name-brand properties like Fox News, Fox Sports, and the Fox broadcast network, gets spun out as a brand new, entirely separate company. The new and substantially slimmer Fox company will operate under the same two-class stock structure as the old one, making no significant changes to the company's ownership. Disney will invest $10 billion in share buybacks between now and the closing of the Fox deal, also committing to another $10 billion buyback over the following 24 months. At today's prices, that works out to retiring 12% of Disney's current market cap, or roughly 180 million shares. Seen from a different angle, that would be 35% of the new Fox shares going back into the vault. DIS Stock Buybacks (TTM) data by YCharts. Image source: 21st Century Fox. What's wrong with cash deals? Other content deals, like the $4 billion Lucasfilm buyout, were paid chiefly in cold, hard cash. Since Disney likes to hold its cash balances pretty steady in the neighborhood of $4 billion-$5 billion, the company has taken on a lot of debt in recent years. Long-term debt balances have raced from less than $13 billion to more than $23 billion in five short years. Tapping the brakes on that long-term trend sounds like a healthy idea. The combination of a large, stock-based buyout and a generous buyback program sends mixed messages. 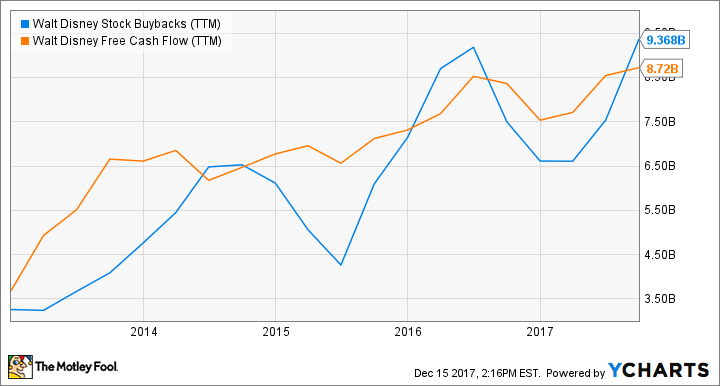 Buybacks usually happen when a company's management believes that its share are undervalued, making it hard to find a better way to invest excess cash than into the stock itself. On the other hand, share-based buyouts tend to follow when the buyer's shares are riding high. By my analysis, the rising buyback budgets say more about Disney's own valuation analysis than the decision to tap into the stock's equity value. Disney could have made an opportunistic play for Fox two years ago, when its own stock was riding an adrenaline high from the first Disney-produced Star Wars movie, and Fox was headed in the opposite direction. The decision to fund this buyout entirely with Disney stock doesn't strike me as an attempt to exploit a skyrocketing stock price. Instead, it seems to be based on a desire to keep the debt balance under control. As a Disney shareholder, I'm OK with that. The Fox deal should add enough business value to make up for this 34% share dilution in short order.